Last Saturday I was very kindly invited along to the Bournemouth Bloggers Christmas event for ‘Make It Bournemouth‘. 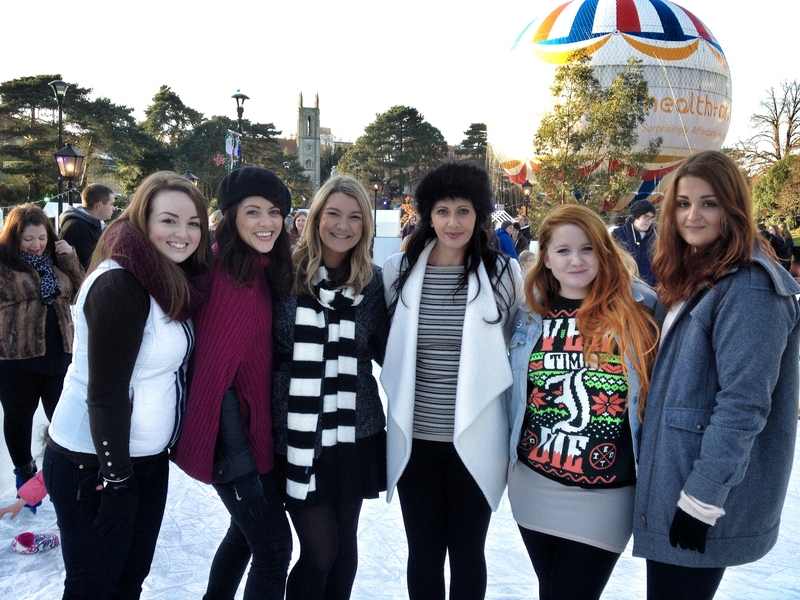 A day of Ice Skating, Mulled wine, some very cool outdoor art and lots of bloggy gossip between the online belles of Bournemouth. Parental reins were passed to my husband and I whizzed off for the Christmas festivities with fellow blogger and friend Rhiannon Duffin from Life’n’style. First we met up at the funkiest cafe in town Flirt for a coffee and a slice of Red Velvet Cake and a chance to meet the others. It was a fab bunch of girls but it did make me wonder, where are the blogging guys of Bournemouth, show yourselves! First up we headed to the Lower Gardens to get our skates on. I haven’t skated for years which is always a scary thought when you’re going to have to give it a go in front of people you don’t know. Particularly when the one person you do know is a former ice princess, seriously Rhiannon has her own skates! After a brief ‘Bambi on Ice’ moment I managed to get going and it was great fun. The sun was shining and it did feel like a moment from a Christmas film but Macaulay Culkin was nowhere to be seen. It’s a really good size rink and there’s plenty of ‘Ice Marshals’ on hand to keep things under control. You know the type, all ‘super cool’ whizzing around doing little tricks and spraying a little ice here and there while the teen girls have a little swoon, aah to be 16 again. For tickets and times for the rink see here. After the skating we had all earned a well deserved mulled wine so we headed off to the German Market and more importantly the bar! Now I have to admit that until this year I had never ventured into the Moose Bar mainly because I thought it was a bit cold to stand around outside. So I felt like a bit of an idiot when I realised the Moose bar is actually pretty big and has an inside area complete with novelty fire-place, booths and Christmas trees. Perfect. Cheryl from ‘Invest In Your Chest‘ and who also helped organise the day played bar maid and rocked up with a tray of mulled wine in wonderfully naff Christmas boot mugs. Delicious! Once warmed up we ventured around the market to check out the stalls and to refuel with a mouth-watering ‘Bratwurst’, now that really is a hot dog!!! As if that hadn’t been enough already ‘Make it Bournemouth’ had even more for us. Now that darkness had decended it was time to visit the ‘Garden of Light’. What is that, I hear you say? Well Michael Grubb a local lighting designer who worked on the 2012 Olympic Park was asked to create ‘something wonderful, playful and fun’ which appeals to all ages. This was my favourite part of the day, Michael has brought the Lower Gardens alive in an otherwise dark and wintry place by filling it with Beach Huts filled with incredible light installations. I can’t wait to come back with my little girl, as a sensory experience this will blow her mind! This really was a fantastic day out, whatever your age there was something for everyone. I will definitely be coming back with my husband and daughter to see the Garden of Light, this is a free event so come a long and check it out. The whole day was so much fun, I made some new friends who all share the same love of Dorset and Bournemouth and I was so impressed with the town this year. Make it Bournemouth really has taken Christmas to a new level. Get yourselves into town! Thanks to Make it Bournemouth and Cheryl for inviting me.